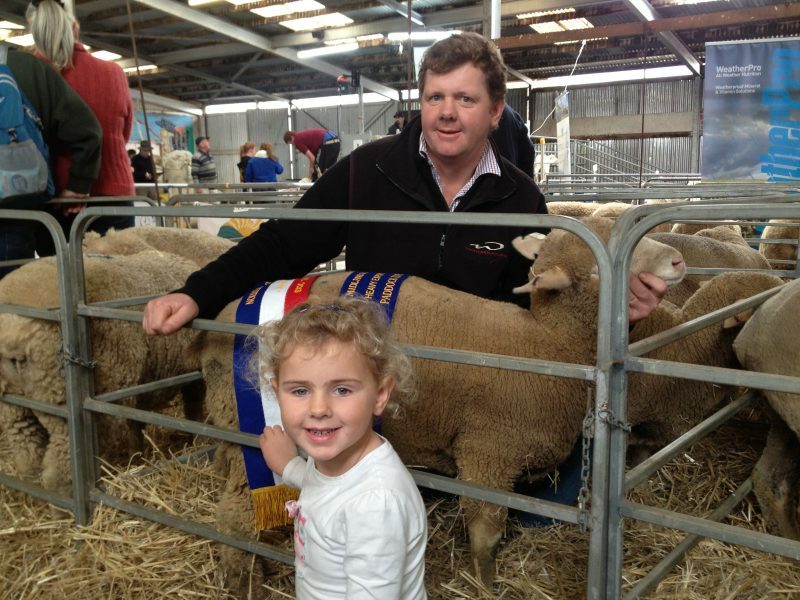 DOHNES have also been successful for Tasmanian sheep producers Richard and Sarah Johnston, Esk Farm, Longford. The couple won the Campbell Town show’s Paddock to Plate competition twice in a row with second cross Dohne lambs. The lambs averaged 56kg liveweight, had a carcass weight of 26.8kg and dressed at 49pc. The carcass from their winning heavy export and overall team scored a perfect 50 points, with the pen of three amassing a total aggregate of 97 from 100 points. The winning carcass had a live weight of 55 kilograms and yielded 49.61 per cent for a dressed weight of 27kg. Adding further validation to the Johnstons’ breeding program, their second entry (of the same breeding) placed second in the heavy export section. The lambs were all grass finished at Esk Farm. Richard Johnston with his daughter Lucy.